According to Eyre Crowe’s diary, he had first painted this subject at Henley in 1872. 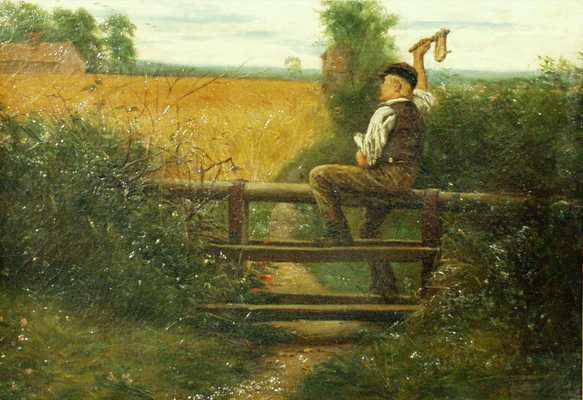 He found the picture again when he moved his effects out of storage and into his Chelsea studio in 1894, and took the picture on holiday with him to Great Yarmouth, where he traced the outline and began to repaint the boy on the cornfield stile. The picture was exhibited at the Royal Academy in the summer of 1897, and at the Walker Art Gallery in Liverpool in the autumn of the same year. The picture, called Jungen Bursche am Gatten in German, was sold at the Walldorf Auctionhouse, Germany, in July 2002, fetching 3,750 Euros. The artist’s third contribution is styled The Crow-Boy (883). The look and gestures of the ragged country urchin, calling aloud and using a rattle to frighten crows from a cornfield, are decidedly good. The rough surfaces and somewhat opaque colour of these pictures are unfortunate, and tell greatly against them.